Thirteen years ago, they came and they departed, leaving behind pins and empties and shriekers and other detritus, all there for the taking if you’re brave enough to make your way into the deadly—and forbidden—landing zones. 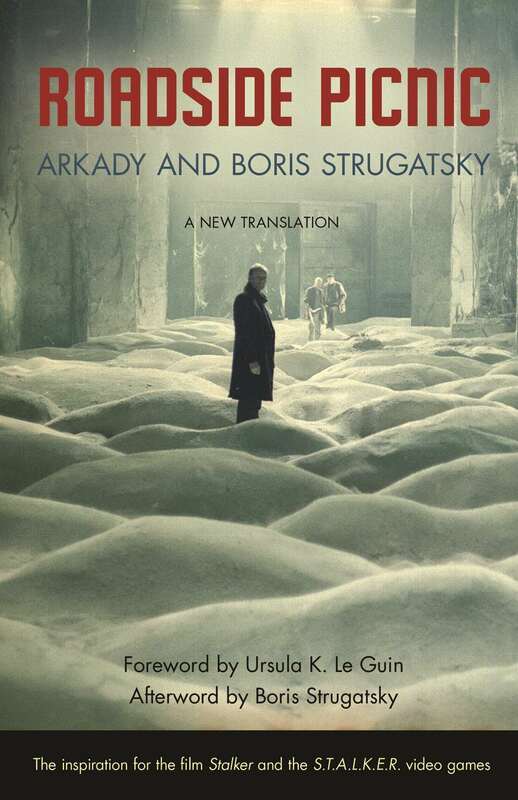 Arkady and Boris Strugatsky’s 1972 novel Roadside Picnic, now available in a new translation from the Russian, tells of a world that is quite literally picking up the pieces after an alien visit. The main character, Red Schuhart, is a stalker, the name given to the people who visit the Zones where the aliens have landed to pick up the gizmos scattered around and then sell them on the black market. When the novel begins, he’s turned his skills as a stalker into a legitimate career as a research assistant in a lab that’s attempting to uncover what these gadgets do. As Tom at Wuthering Expectations notes, we don’t learn much of anything about what all these objects do. The scientists and stalkers find uses for some of them, but they don’t understand how they work or if they’re even using them correctly. (I was reminded of the way the characters in the Dark Tower books use the objects left behind by the old ones, only in Roadside Picnic, the knowledge gap is even greater.) This lack of information might annoy some readers, but, like Tom, I enjoyed the mystery of it. I suspect that any explanation would be anti-climactic, so best to leave it to the imagination. The Strugatskys begin the novel years after the Visit, after the alien artifacts and the bizarre phenomena around the Zones had been first discovered. So these happenings are not as strange as it is to us. Red is almost matter-of-fact about a lot of the alien objects, although he knows better than to be casual about the dangers in the Zone itself. The Zone is filled with what seem to be booby traps, although there’s no reason to think they’ve been deliberately set (no reason to think they haven’t, either—there’s no information at all, really). Besides the traps, the Zone has also created living corpses—Red’s dead father lives with him. And even those who survive the Zone end up changed, their genes altered in ways that affect the next generation. So that’s the world of the novel. It’s cool. What about the story? The characters? The story is told in bits and pieces with each of the four lengthy chapters almost able to stand on its own. Most of the chapters focus on Red; each one ends with some major event and then the next picks up a few years later. The one chapter that is not focused on Red includes him as a major character. We get vague ideas of how the world has changed, but the plot, such as it is, is more about how Red has changed. In her introduction to the novel, Ursula Le Guin says that one of the things that sets this book apart from other science fiction of its era is that the main character is not part of the elite. Red works in a science lab, but he’s not a scientist. He’s a smart, savvy guy, but no intellectual. He’s a criminal, but a good man. His worst acts are generally to support or protect someone he cares about. Although I never mustered up a strong emotional attachment to him, I did like him, and there were moments, particularly in his interactions with his daughter, when I came close to caring quite a lot. But in the end, this is a book whose pleasures are mostly in the world it depicts. All the alien contact stories I can think of involve actual contact, and this story, with its lack of actual contact, felt fresh and different and perhaps more realistic than the first-contact stories that presume that aliens would be something like us, or would at least be interested in us. This sounds really intriguing. I do like the fact that — as LeGuin pointed out — the protagonist is just an ordinary Joe who happens to come into contact with these artifacts. He is a great protagonist, and the fact that he’s not a scientist I think gives the book a different focus. It makes it easier to get away with not explaining the objects so much. I read this years ago; interesting timing for a new translation. If you like the alien artefacts theme, have you read Fred Pohl’s Gateway books? I’ve never even heard of those. I’ll look them up! I love this book. It’s one of maybe five or six science fiction books I truly appreciate, and it may well top the list. You raise a quite nice point, that Red is a sort of anti-hero – though the end of this novel seems to me as “heroic” as many far more canonized works of literature. While it’s the best of the 5 or 6 Strugatsky brothers’ books I’ve read, I can also recommend their more fantasy-oriented effort, Monday Beings on Saturday, which has been referred to, with audacity of no small ironic tint, as the “Harry Potter” of Russian literature (assuming you can find a copy – definitely go for the unauthorized DAW paperback translation – while a more humble edition, it’s head and shoulders above the other, more easy-to-find illustrated version entitled Monday Starts on Saturday). I liked Red a lot, both for his skill at getting through the Zone and his dedication to his family. His attitude toward his father and his daughter got to me a bit. I’m still pondering the very end. I love him for the final sentiment that he expresses, but what he does to get there gives it a dark edge. Yet in a sense he’s damning himself for the benefit of the whole world, which is, as you say, as heroic an act as you’re likely to find in literature. Sorry – a correction: Monday BEGINS on Saturday. Monday BEINGS on Saturday, while totally incorrect, is a novel I hope someone will write one day. So glad you liked this one. I had never heard of it until last spring, then found out a friend is totally nuts about the film. I haven’t seen it yet but my library has a copy so I will at some point. I may have to look into the film. I watched Solaris, another film by the same director (Tarkovsky), several years ago, and it was really interesting. I’d like to see how he handles this story. Yeah, it’s pretty good, isn’t it? Red is lifelike, the writing is good, some of the best I have come across in science fiction – which sounds perhaps more negative than I mean. I’m just agreeing with Scott, I guess. The funny thing about Le Guin’s line, which I think is basically right, is that Red is in some sense elite, an elite Stalker, the best of the kind. I wonder if science fiction in general has trouble with the ordinary. Something about its adventure-fiction roots. The scifi protagonist con-man or soldier or computer hacker has to be a super-con-man etc. Eh, there are probably heaps of good stories and novels proving me wrong. I wonder if the type of science fiction would affect how ordinary a character could be. You’re not likely to have ordinary folk going into space, so everyone in something like The Sparrow or Ender’s Game would be the best of the best. But an apocalyptic dystopian book or an invasion story might be able to get away with a cast of more ordinary people.